Business intelligence is the set of strategies, applications, data, products, technologies and technical architecture, aimed at obtaining and managing knowledge, through the analysis of existing data in the organization. 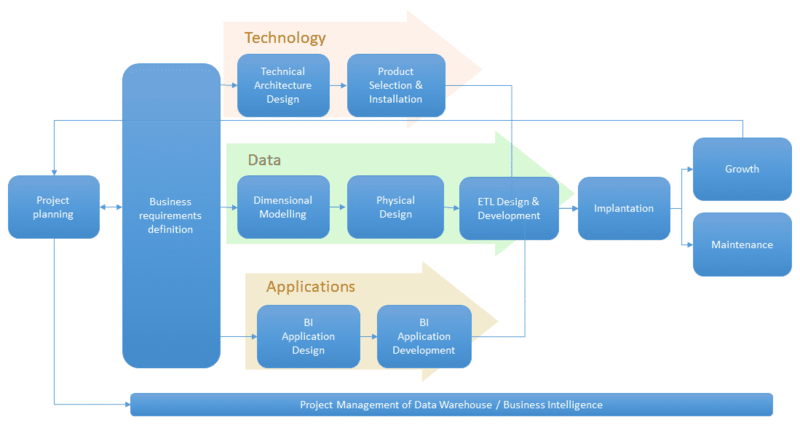 It should be noted that the creation of a data warehouse represents the first step from the technical point of view, for the implementation of a complete and reliable business intelligence solution. Talend Open Studio: Open Source Tool. Dashboard is visual summary of information about the business. All the information can be understood at a glance. Dashboards use Key Performance Indicators or KPIs. app.R – Shiny Dashboard in R.
ui.R/server.R – Shiny Dashboard in R.
OLAP streamlines non-predefined queries over large data sets. See more analysis as HOLAP, ROLAP y MOLAP. Reporting applications predefined aggregate data views, in order to keep your users informed about the status of your business. Data Mining discovers patterns in large volumes of data, in such a way that the patterns obtained allow the extraction of knowledge that is understandable by human beings. Different studies indicate that around 60% of business intelligence projects fail, so knowing the reasons of these failures can make our project a success. Focusing mainly on technology instead of business needs, people and processes. Lack of sponsorship on the part of the management or the middle management. Do not define a scope or this is not accurate. Undefined and difficult to structure requirements until they have been implemented. Inability to structure a long-term sustainable architecture. Inability to provide quick solutions to managers anxious for short-term information. Impossibility to obtain medium-high quality data. Lack of scalability and system evolution. Do not consider future requirements, in terms of new users or data sources. Try to make a prototype of tests become the definitive solution. Excessive dependency of a supplier, tool and implant. Must be able to zoom in order to see the details of the data, but without having to replicate the transactional system. Over-detail (or granularity) of data can make the project an unapproachable problem.